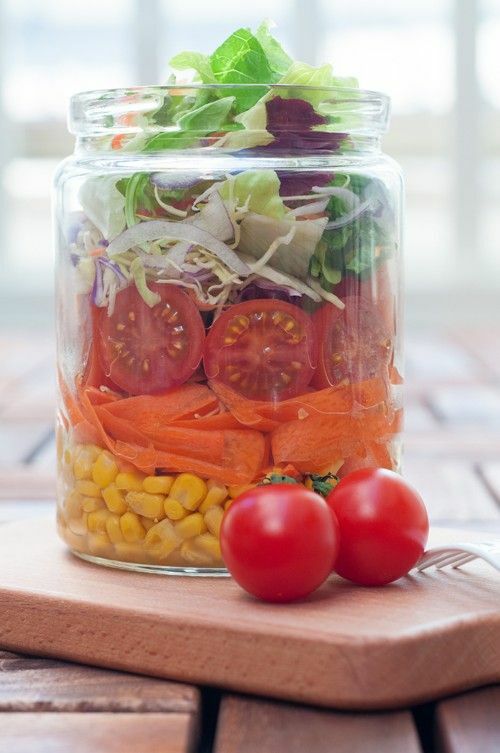 The mason jar salad is the latest fashion to solve the boring task of packing your lunch. It’s portable, healthy, easy to make and offers room for plenty of variety. Dressing goes on the bottom, veggies and other salad goodies get layered on top. Everything stays separate and dressing-free until you shake the jar, then empty its content into a bowl. As long as your jar doesn’t accidentally tip over you in your bag, the delicate greens will be well-protected from the dressing until you’re ready to eat. Even better, these salads last a few days in the fridge so you can make a few ahead of time. What’s the best jar to use? Any canning jar can be used, but wide-mouthed Pint-sized (1 litre) jars are the easiest for both packing the salad and shaking it out. How do you layer the ingredients? The salad dressing goes in first (about 2-3 tablespoons). In the bottom go the heaviest, moister-resistant veggies, like carrots, cucumbers or peppers. Next add any beans, grains, and/or pasta. Proteins and cheese. If you’ll be eating the salad within a day, add a layer of crumbled cheese and proteins like tunafish, chicken, eggs, or tofu. Next, add any soft vegetables or fruits, if you’ll be eating the salad within a day. On the top go the nuts, seeds and salad greens. Use your hands to tear them into bite-sized pieces then pack them into the jar fairly compactly. How does everything get mixed together? When you’re ready to eat your salad, shake it, then pour it into a bowl and toss it with a fork. That’s all. How long will these jars keep in the fridge? With the lid sealed tightly, these salads can last for up to 5 days or so. If you’re making salads with soft ingredients such as avocados or tomatoes, and perishable proteins such as hardboiled eggs, or cooked chicken breast, it’s better to wait to add these ingredients until the day you’re planning to eat the salad and add them on top of the jar. Try our Greek Salad with Chickpeas for your next lunch break. As you can imagine, the combinations are endless. Do you ever pack your salads in jars? What are your favorite combos? Any other tips to share from your experience?